A Sweet 16 theme can transform the standard ballroom at your event venue into a magical backdrop for a unique and unforgettable celebration. It sets the tone and ambience for the evening, and can touch every element of your event, from your attire and décor to the cake and favors. Masquerade balls have been popular for centuries, and have long been associated with wealth, class, elegance, and mystique. 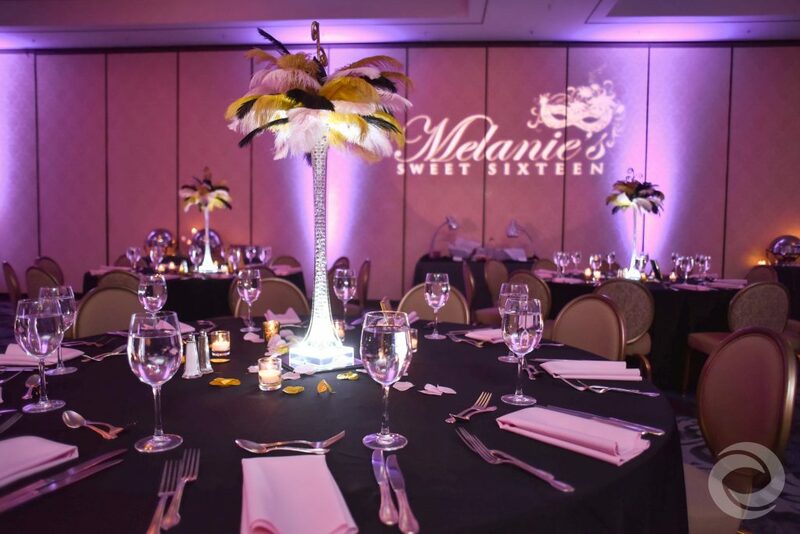 Melanie’s masquerade celebration was a modern Sweet 16 with elements of the traditional quinceañera. 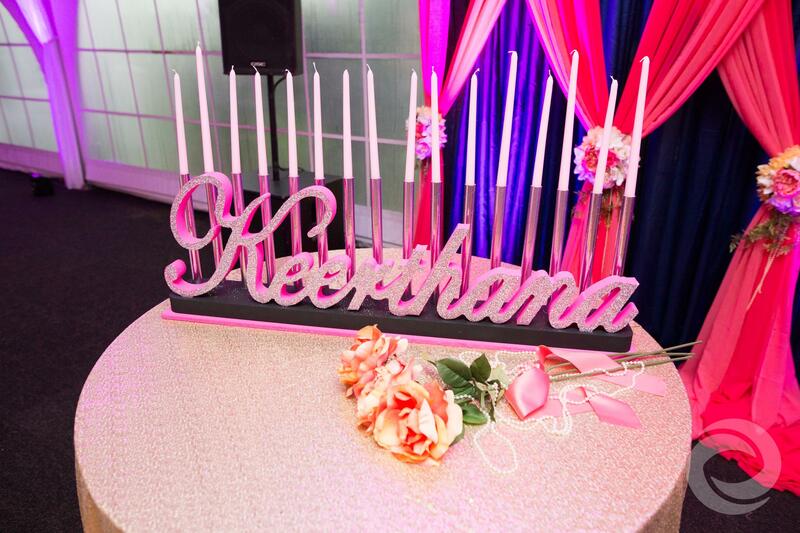 The classic masquerade mask, which some of the guests wore during the evening, was incorporated into the birthday girl’s custom Name in Lights display, designed by Hurricane Productions. 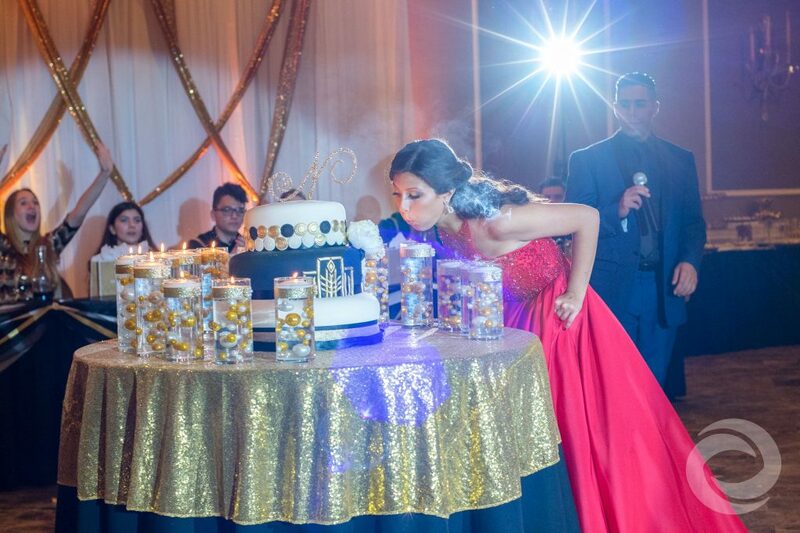 Sabrina Ann blowing out her Sweet 16 Candles at the Ria Mar in South River, NJ. From her Belle-inspired ballgown, to her birthday cake topped with a Belle-and-Beast silhouette topper, Sabrina Ann's Sweet 16 at Ria Mar was all about Disney's "Beauty and the Beast." A blue and gold color scheme, red rose décor, and a Disney-style custom Name in Lights and Snapchat filter from Hurricane Productions tied Sabrina Ann's theme together. At Samantha's Sweet 16, held at The Excelsior, the birthday girl highlighted her favorite symbol of good luck and fortune: an elephant with an upward-facing trunk. Inspired by the mythology behind the elephant, Samantha celebrated Indian culture at her event with traditional sarees and henna body art. Hurricane Productions also created a custom animation based on her theme. New York in the 1920s was all about glitz and glamour, and what better way to celebrate that era's opulence than with a "Great Gatsby"-themed Sweet 16? For Nicolette's celebration, Brooklyn's Gargiulo's Restaurant was decked out in black, silver, and gold, while the birthday girl stood out in her gorgeous red ballgown. With a sophisticated cake and custom animation to match the color scheme, Nicolette's evening truly brought this classic American novel to life. If you can't choose just one favorite princess, why not celebrate with them all? 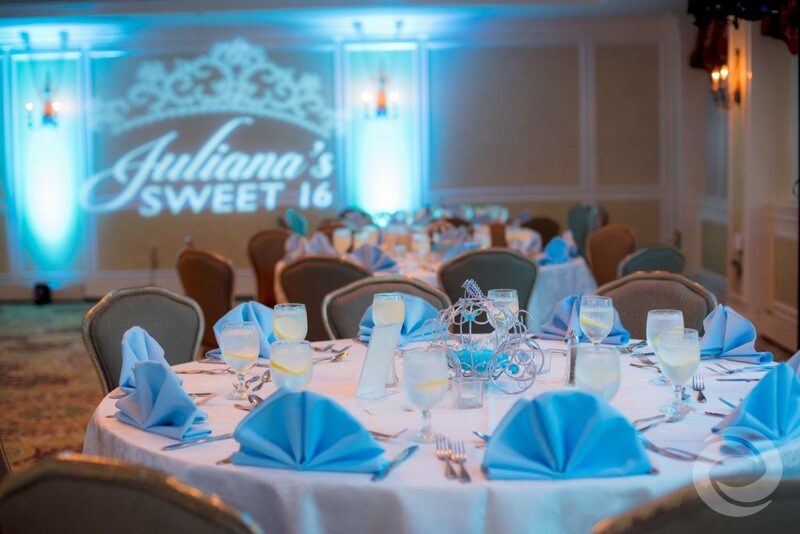 Juliana's Sweet 16 at Bridgewater Manor celebrated all of the birthday girl's favorite fictional royalty, from her Cinderella-carriage centerpieces and castle-topped cake, to her Tinkerbell-inspired ballgown and shoes. Aside from her castle-and-tiara custom animation, the most magical part of Juliana's event was an outdoor paper lantern send-off. You can check out some more incredible themed celebrations we've been a part of over the years in our Sweet 16 portfolio. Popular themes include Paris, Arabian Nights, and Nightclub, but there are plenty of unique ones, like Winter in Moscow, Victoria's Secret, and Caribbean. Hurricane Productions provides a full suite of media and entertainment services for all special occasions, including Sweet 16s and Quinceañeras. Visit our pricing page or contact us to learn more about our all-inclusive packages for your special birthday celebration.